Kevin Harvick started eighth, finished sixth and scored five bonus points. The No. 4 Ford came to pit road for four tires, fuel, wedge and air pressure adjustments under the competition caution on lap 52. Harvick’s car and the No. 10 of Aric Amirola made contact following the lap-52 pit stop, causing cosmetic damage to the right front fender of the No. 4. The No. 4 Jimmy John’s Ford restarted sixth on lap 56 and maintained the position through the end of the stage. Harvick came to pit road for four tires, fuel, wedge and minor repairs to his car’s right-front fender at the end of the stage. Started eighth, finished sixth and scored an additional five bonus points. The second stage ran caution-free, and Harvick raced from eighth up to sixth by the end of the stage. The Jimmy John’s Ford came to pit road for four tires, fuel and a small adjustment at the conclusion of the stage. Started fifth and finished fifth. Harvick raced his way from fifth up to the fourth position by the caution on lap 385. The No. 4 came to pit road under caution on lap 387 for four tires, fuel and adjustments and came out in the fifth position. Harvick raced his way through traffic for the final 109 laps without incident and finished fifth. This was Harvick’s fourth top-five of 2018. This was his fifth top-five and 16th top-10 finish in 34 career Cup Series starts at Martinsville. Harvick finished sixth in Stage 1 to earn five bonus points and sixth in Stage 2 to earn an additional five bonus points. 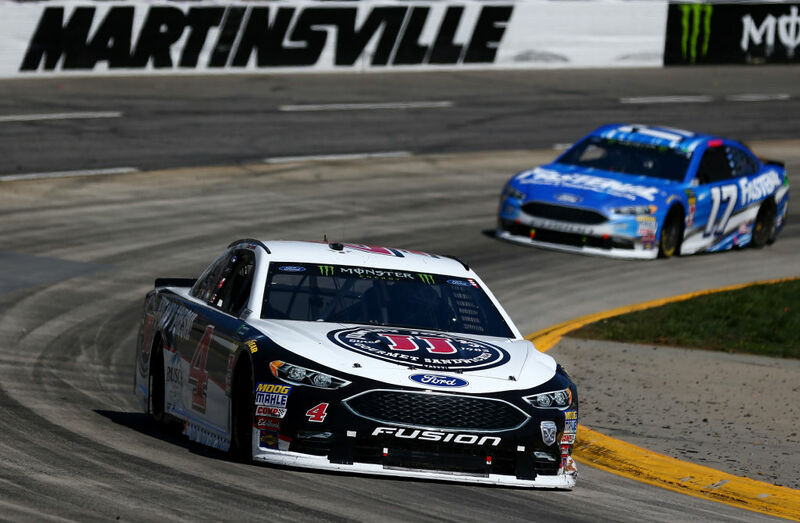 Bowyer’s victory in the Martinsville 500 marked the 47th overall win for Stewart-Haas Racing (SHR). It was the organization’s 43rd points-paying Monster Energy NASCAR Cup Series win and its fourth at Martinsville. There were four caution periods for a total of 33 laps. Fourteen of the 38 drivers in the Martinsville 500 finished on the lead lap. Bowyer’s margin of victory over second-place Kyle Busch was 1.146 seconds. The next event on the Monster Energy NASCAR Cup Series schedule is the O’Reilly Auto Parts 500 on April 8 at Texas Motor Speedway in Fort Worth. The race starts at 2 p.m. EDT with live coverage provided by FS1.